The Estate Swing 433 Mhz transmitter module can be wired into any accessory that normall has wires run to the gate opener to convert that wired accessory into a wireless that is compatible with: New Apollo (only when purchased through gatecrafters.com) and Estate Swing gate openers. Existing Estate Swing openers from 2012 or newer. Any devices paired with the 433ESREC receiver . The Estate Swing 433 MHz transmitter module is a very unique product that can make almost any accessory into a wireless accessory. This transmitter module has two activation wires. For any accessory that normally gets wired into a gate opener that simply momentarily closes a dry contact (which is just about any keypad, loop detector, exit wand, push button, or photo cell) simply wire the two activation wires into the terminals or wires that normally lead back to the gate opener for activation. When the accessory relay triggers closing the dry contact the transmitter is activated and send a wireless signal to the receiver on the gate opener just like a remote would. Please note with the accessory you are making wireless with this device: you will still need to plan to power your accessory - some accessories can run off batteries and some cannot. Please be aware that you may need to run some lines from a power source to your accessory even if you are converting its triggering of the gate opener to wireless. The transmitter module is small in size and can fit into the housings of many different accessories. It is2 1/2 x 1 1/4 x 1/4 inches and connects to a 9V battery. For those devices that cannot fit this transmitter module into its housing we have an option with a very small plastic box to mount near the accessory. Convenience is the first thing that comes to mind for most when deciding to convert an accessory to wireless. It is an easier installation when you do not have to run wires 40 or 50 feet to your keypad or other accessory. It can also save you money as wire is one of those installation materials whose cost can add up quick depending on the footage needed. There is another advantage to wireless however. The more wires you have running under ground and leading to the control board of the gate opener the higher your power surge / lightning risks become. Transient voltage carries through the ground during a lightning storm and can be picked up by wires running through the ground. If you have many wires tied back to your gate opener control board you are increasing your chances of having to replace a very expensive component of your gate opener system. 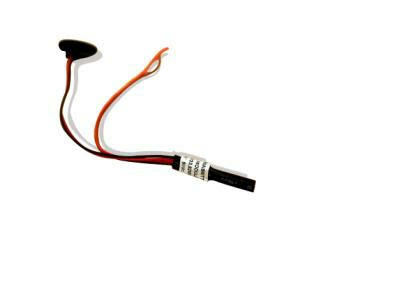 Small Size: 2 1/2 x 1 1/4 x 1/4 inches and connects to a 9V battery. Universal Adaptor: Wires into any accessory that momentarily closes a dry contact. Strong Range: The transmitter module has a range of 300 feet. With a powerful 433 MHz frequency this transmitter module will be very reliable for entry and exit. Learning code: Learn the transmitter module by either touching the two activation wires together to send a signal or buy activating your accessory – either of those while the receiver is in learn mode. Your module is then set to that receiver . Module Only: This is just the module without a housing. You will need to insert this into the housing of the accessory and provide a 9 volt battery. Module w/ Housing: This is a package with the transmitter module and a plastic housing box for the module and the battery. You will need to provide a 9 volt battery, a dab of caulk, a screw appropriate for the material you are mounting the box to, and possibly additional wire depending how far you are mounting the transmitter module from the accessory.